This is a photograph from the 'Please Give Jane a Voice' Charity 5KM Road Race, Fun Run, and Walk which was held in Castlepollard, Co. Westmeath, Ireland on Sunday 16th February 2014 at 13:00. This race was held as a fund raiser for local girl Jane Boyle Regan who is 7 years old and is in need of a life-saving operation in Switzerland to help open her airways and rebuild her vocal chords. This is a very very good cause and the proceeds of the run today will be put towards the very substantial costs involved in this operation for Jane. Runners, joggers, and walkers from around the Castlepollard, North Westmeath, and Oldcastle area came out in force today and there were over 200 participants in the event. 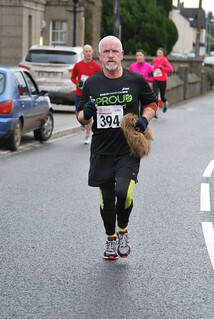 The race followed an out and back loop on the R195 towards Oldcastle with the race starting and finishing in the market square of Oldcastle on Church Street. Refreshments were provided in the parish center. Attribution- anyone using our photographs gives us an appropriate credit for it. This ensures that people aren't taking our photographs and passing them off as their own.